Pillowcases are something we all have. Some have heaps, some have a few, and somepeople scour op-shops to turn pillowcases into glorious little dresses for equally glorious little girls. 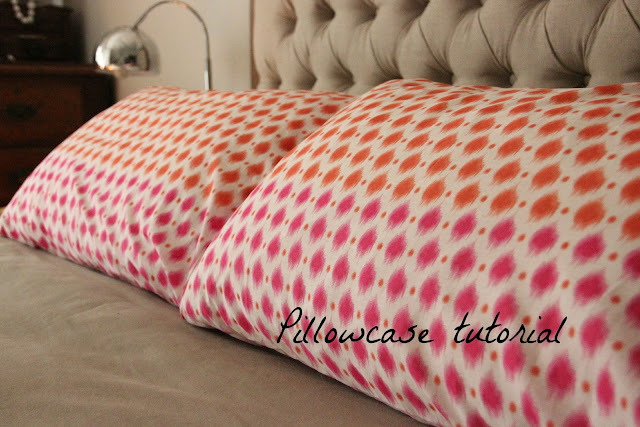 Until the day I revamped my bed linen, I'd never made a pillowcase. And never knew how easy it was. Well actually I'm pretty sure I knew it would be easy, but I just can't quite comprehend why it took me so long to get making them. And now I'll show you. It's super easy and if you have a sewing machine, and can sew straight lines then this tutorial is a winner for you. If you are an advanced sewer then just be reminded that the simpliest of things can also make your day happy....sometimes we all need a quick ten minute project! Fabric of your choice preferably 160cm wide or in length as then you can just cut one piece. Cut your fabric 160cm by 48cm (this will allow for about 2 cm seam allowances on the short end and 6mm seam allowance on the length). Iron each short end 5mm and then again to create neat seam. Stitch using a straight stitch across these two ironed edges. Now, fold your fabric right sides facing to 70 cm which will make 15 cm of fabric over hanging from the length underneath. Fold this flap back down over so that the fold line meets the short end and secure with a few pins. It will seem like you are closing up your pillow,but you are making the envelope casing. All you have to do is serge, zig zag or single stitch (if you don't mind a raw edge!) down both sides, sewing through all layers. The envelope opening that you created folding down the excess fabric will allow you to turn your pillowcase the right side out. Fill with a pillowcase, stand back and admire your work! Now, go make more in all the colours and patterns your hearts desire! Makes a great gift too! Lordy! How fabulous! How have I been living in a world without my own pillowcases??? Am adding this to my 'making' pile! See, this is why I NEED a sewing machine! I've never made a pillowcase either. Goodness knows I have far too many sitting in the cupboard - mostly vintage that I bought for sewing but then end up using for pillowcases because I have "issues" with cutting into good vintage pieces! Yours look very lovely, and I'm thinking a few liberty pillowcases might give my bedroom a little revamp. Very easy! Love your fabric choice .